Not only will this super Retro Slush Maker help capture the look and feel of a 1950's kitchen or diner, it will also make fruity frozen slush drinks in your own home. 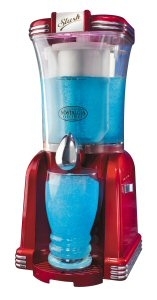 The Retro Slush Machine is perfect for entertaining on hot summer days, as it will provide your guests with an endless supply of ice cold beverages. This Slush Maker makes a great addition to any kitchen, and it's sure to keep visitors entertained, and happily hydrated for hours on end, and if you want to make your own slush drinks at home, this is so much easier than a load of ice cubes and an ice-pick!